I’m ALIVE! If you were afraid that I had been taken hostage or trapped beneath heavy furniture, fear no more! 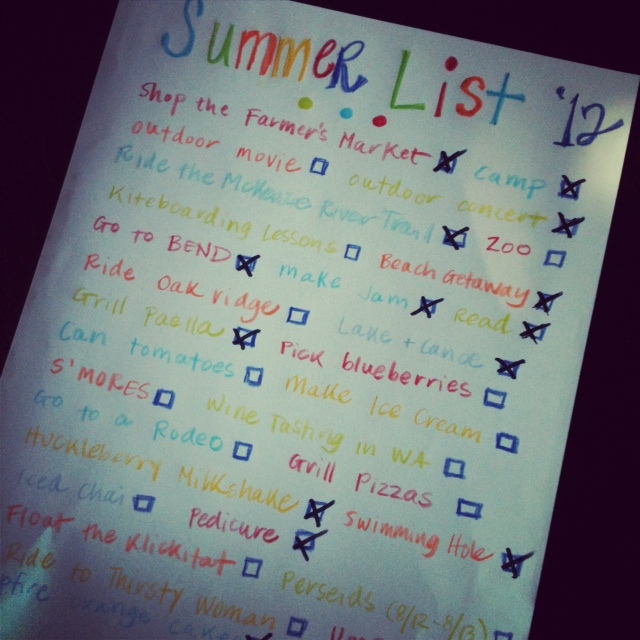 We have been busily checking items from our Summer List, which has left me little time to blog. So, to all ten of you who read this thing (Hi, Mom! ), I apologize for my radio silence. I’m pretty sure that all will be forgiven once you see what we’ve been up to. 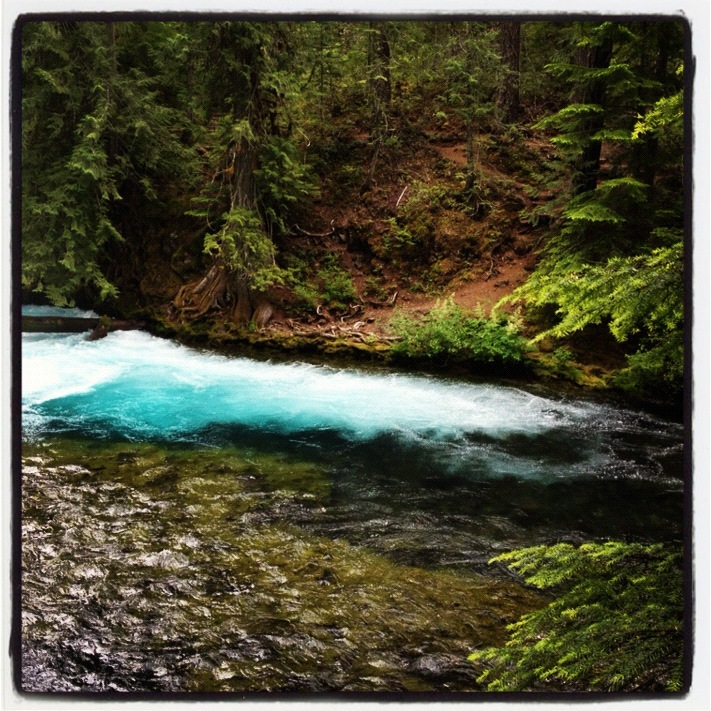 after camping with our good friends Jeff & Tina on this lake…. Step ONE: Build a medium sized fire and let it get going. It doesn’t need to be huge (you don’t want to singe your eyebrows), just big enough to tickle the pan. Then saute yo’ meat. We used chicken andouille sausage and boneless, skinless chicken thighs. When they are cooked through, remove with a slotted spoon, retaining the juices. Step TWO: Add your onion and saute until golden. You will need to rotate the pan often to ensure even cooking. This is where a nice pair of LONG tongs comes in handy (we lost ours, so I had to improvise). 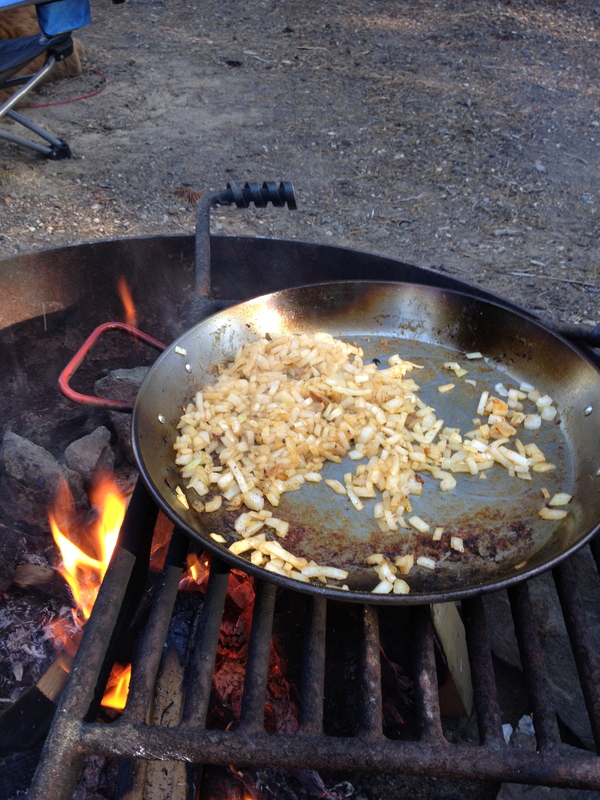 Once the onion is nice and caramelized, throw in your garlic, salt, paprika, and a huge pinch of saffron threads. Coat the onion evenly. Stir in your diced tomatoes, with juice, and give it a good stir to mix it all together. Step THREE: Add your bomba rice, coat with tomatoes and spices, then add white wine. Let the wine cook into the rice a little bit, then add in the chicken broth. Mix it all together. Try to look like Clint Eastwood while you do this (Matt calls this my smoke face). Now comes the hard part: DON’T TOUCH IT! 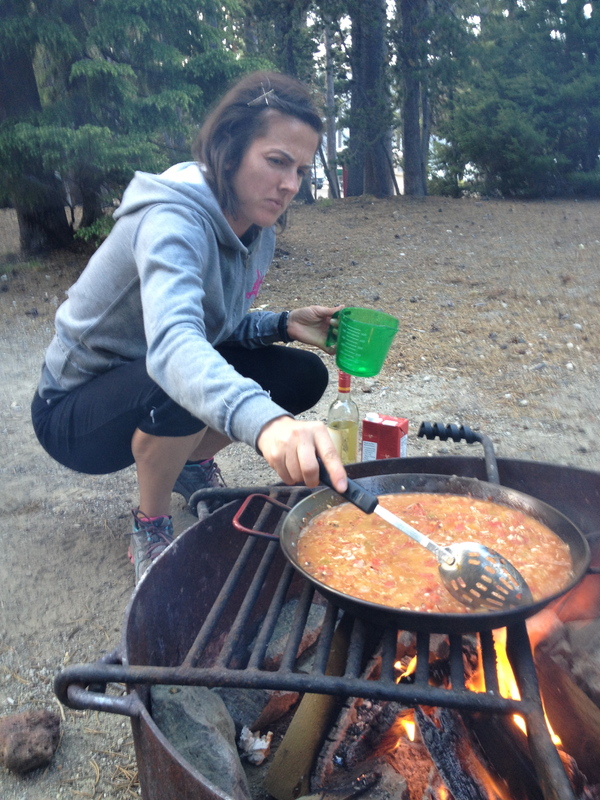 Seriously, keep your grubby little paws OFF the paella. You want a nice crusty layer to form on the bottom of the pan. This is called socarrat, and it is delicious, so LEAVE IT ALONE. Step FOUR: Let the rice simmer for about 15 minutes, rotating the pan occasionally so that it cooks evenly. Then, in an even layer, without disturbing the rice, add the meat back into the pan. 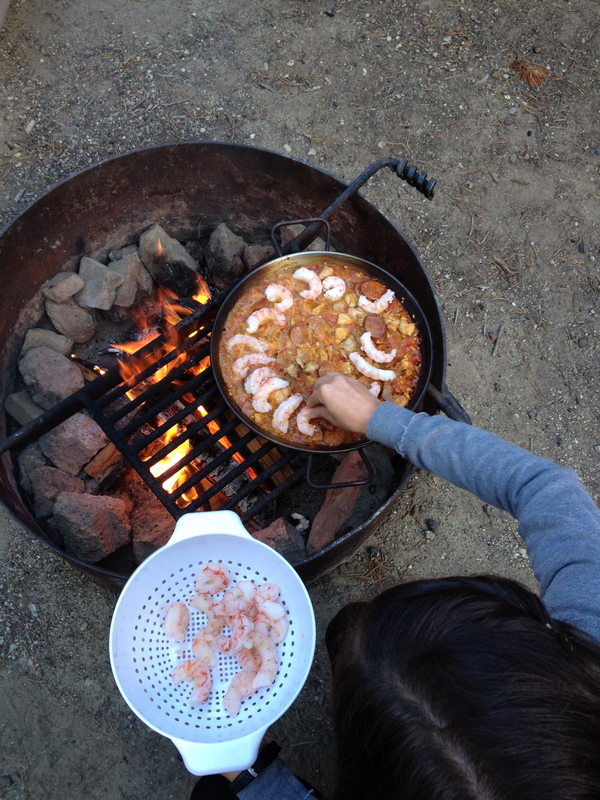 Top with an even layer of peeled shrimp (tail on looks real pretty, but we are roughing it here, folks). Let the shrimp cook for another 10 minutes or so, until done. If you don’t feel like they are cooking, you can cover the pan with a layer of foil. Step FIVE: Remove the pan from the fire. It will be HOT, so find a safe place to let it rest. Cover it with foil and let it sit for about 5 minutes. Sprinkle with parsley and fresh lemon. Then DIG In! Make sure to get some of the socarrat from the bottom of the pan. ¡Delicioso! Oh. And did I mention dessert? Sit down, I’m not done here. But you could use any type of cake mix that you like. Just follow the directions found on their blogs and you will be in HEAVEN. As per Em’s recommendation, we saved the scooped out orange flesh for our juice the next morning. Holy orange balls! We were so glad we did. 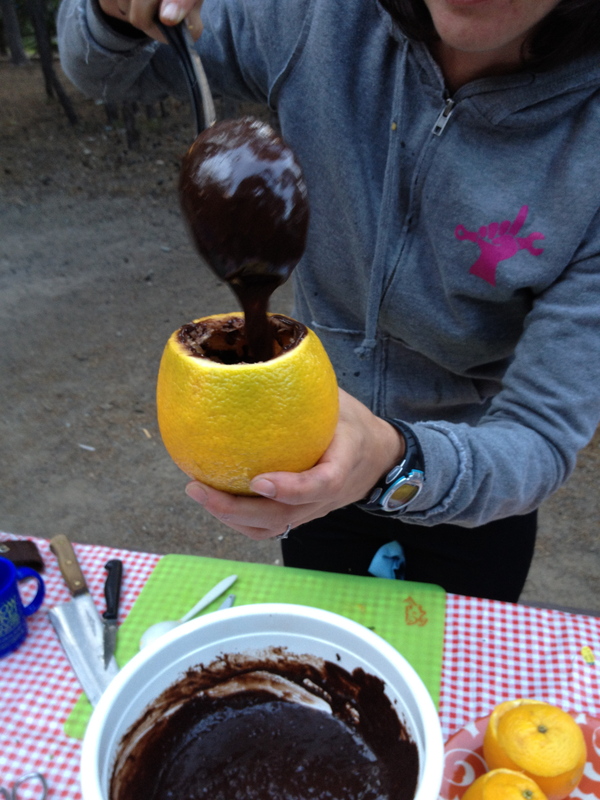 And that, my friends, is how you stuff your face on a camping trip! Jeff and Tina, thank you for being such gracious hosts and guinea pigs! When can we go again?! 1. 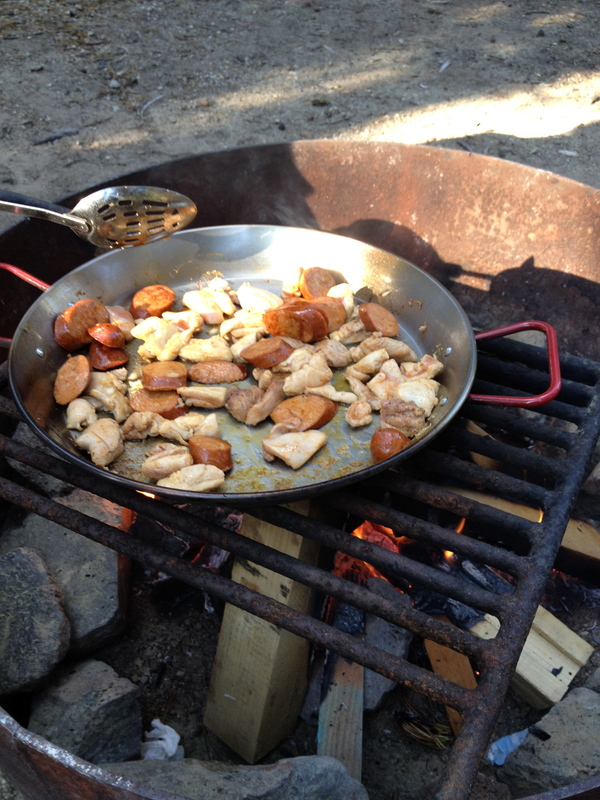 Over a medium campfire, equipped with grill, heat a tablespoon of olive oil in a 13.5 inch pan. Add sausage and chicken thighs. Cook through, then remove with slotted spoon (retain the juices). 2. Add more olive oil to the pan, then add diced onion. Cook until soft. Add garlic and a teaspoon of salt, paprika, and large pinch of saffron threads. Coat evenly. Add the can of diced tomatoes, with juice, and stir to coat. 3. Add bomba rice, stir until evenly coated with spices and tomatoes. Add wine and let simmer for a minute or two, until about half of it cooks out. Add chicken broth. Don’t touch from here on out! Let it simmer for 12-15 minutes, rotating the pan occasionally. Add an additional splash of broth if you find that it is cooking too quickly out of the pan. 4. Add the chicken and accumulated juices in an even layer. Press into the rice a bit, using the back of long tongs. Add shrimp in an even layer and continue to cook for about 10 minutes longer. If it’s not cooking, cover – carefully – with foil. 5. Remove the pan from the fire, and carefully cover with foil. It will be HOT. Let it rest for 5 minutes. Serve with fresh (Italian) parsley and lemon wedges. Glad to see you back in action. I missed you! Your feast looks amazing!! 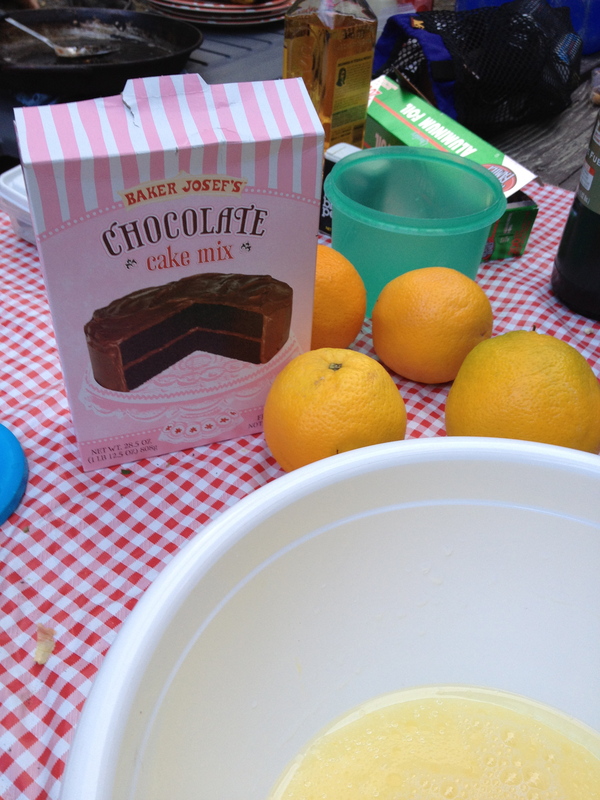 I guess the little cakes were also amazing and disappeared before you could take a photo of the final product, ha! I want to go camping with you, soon!! 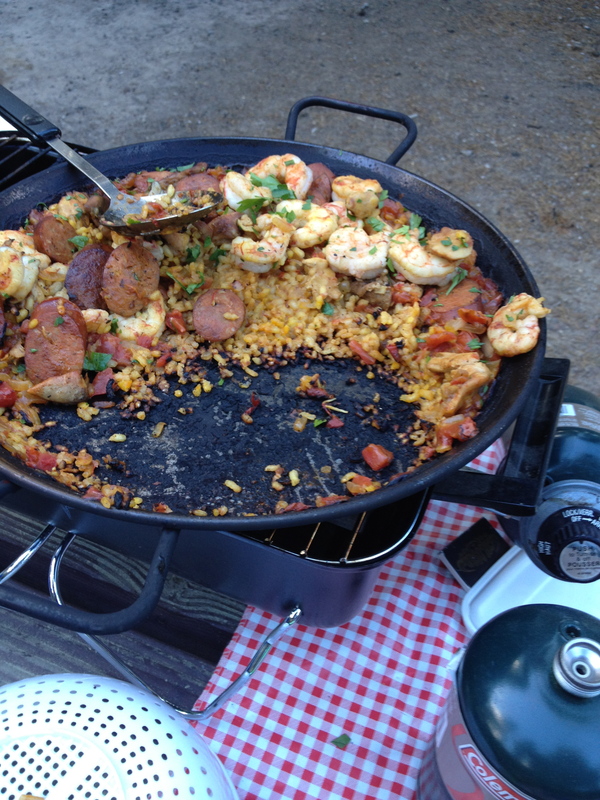 We just had a paella party too! But I wanna do it over open flames! Let’s do it together! YES, Kacie! I love this idea!!! I made this while camping this past fall. It was pitch dark and there were daddy long legs all over the place. My friends LOVED it!! I’ve made it at home too. I’m definitely making it at Bonnaroo this year for the Wednesday Night Feast! Thanks for this wonderful recipe! Late to the party, but I’m curious: how much does the 13.5″ recipe yield? This fed four hungry adults… and we had leftovers! 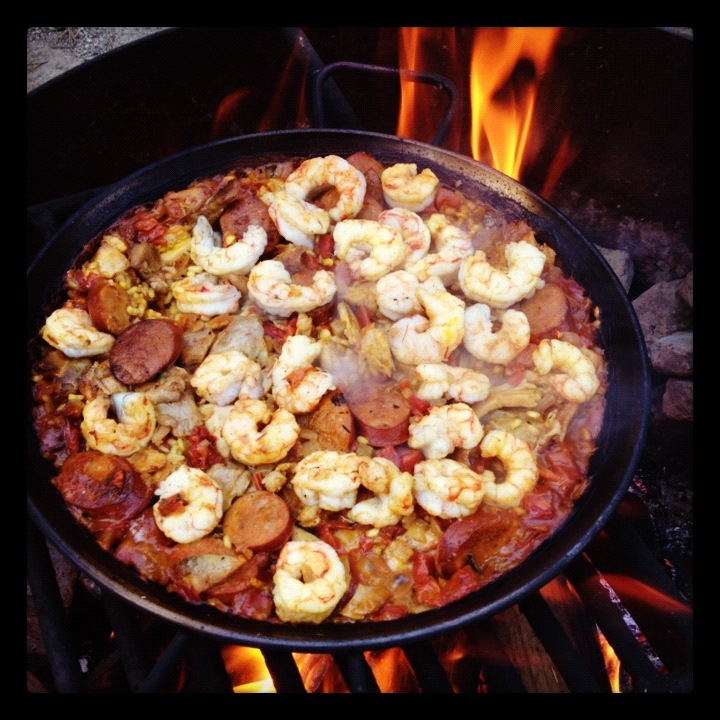 I also have been eager to make paella over a campfire since watching that show…I finally had the chance this past weekend. Google led me to your perfect recipe and I followed it exactly (except I used chorizo). It was amazing and earned me rave reviews. Thanks so much for sharing…I’m so glad the Internet gods led me to your site!